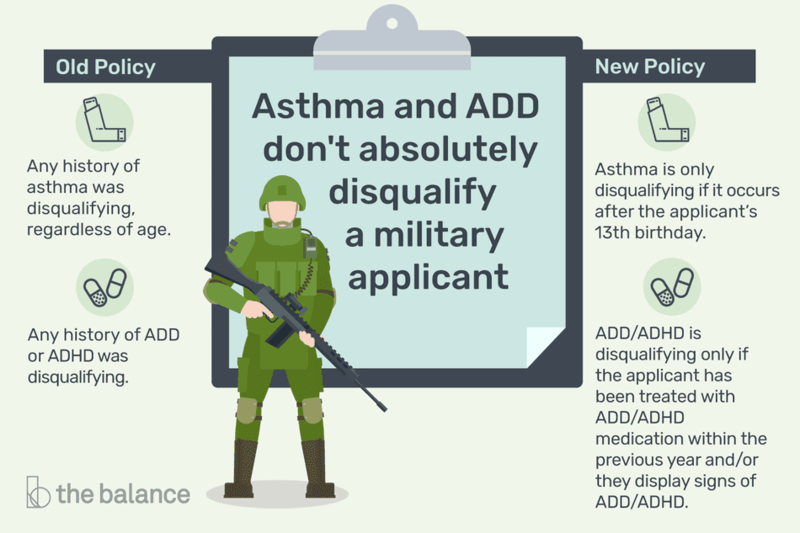 Since 2014, the Department of Defense has changed its medical qualification standards for recruits with cases of childhood asthma, or a history of Attention Deficit Disorder (ADD) and Attention Deficit Hyperactivity Disorder (ADHD). Children under the age of 13 can often be misdiagnosed with ADD/ADHD issues, and any asthma since the age of 13 may still be disqualifying. But waivers may be available to those with these conditions on a case-by-case basis. Previously, any history of asthma was disqualifying, regardless of age. While medical waivers were sometimes possible, waiver approval usually required scheduling and passing a pulmonary function test. In the present day, asthma is only disqualifying if it occurs after the applicant’s 13th birthday. Some waivers were granted back then, but typically only for non-combat jobs. Medical record screening may still be required, depending on the applicant’s medical history. However, in many cases, a signed statement, attached to the medical pre-screening form, stating that the applicant did not have any type of asthma (including exercise-induced, or allergic asthma) or treatment for asthma after their 13th birthday will be sufficient. Also having no issues with the fitness test helps in this process too — so arrive in shape with no cardiovascular weakness. Applicants who have experienced asthma or reactive airway disease after age 13 will require all medical documentation. Waivers may still be considered, depending on the applicant’s medical history and possibly results from a pulmonary function test. For many years, anyone with a history of ADD or ADHD was ineligible to serve. While waivers were sometimes possible, they were among the hardest categories of waivers to get approved. Under the modern-day standards, ADD/ADHD is disqualifying only if the applicant has been treated with ADD/ADHD medication within the previous year and/or they display signs of ADD/ADHD. For applicants with a previous history of ADD/ADHD who have been off medication for more than one year, and who do not demonstrate significant impulse activity or inattention during entrance processing, the examining official may find them qualified for military service without submission of a waiver. However, chances are high that a records review will be required. Any history of being evaluated or treated for ADD/ADHD must be documented. As a minimum, any treatment within the previous three years must be submitted as part of the medical pre-screening. Full medical records are required if the applicant was ever treated for ADD or ADHD with any medication other than Ritalin, Adderall, or Dexedrine, or if there were any additional psychiatric symptoms, such as, but not limited to, depression. Entrance officials may require school transcripts to demonstrate acceptable academic performance without medication. If treatment for ADD/ADHD occurred throughout the school environment but wasn’t stopped until after the applicant left school, there is still the possibility of waiver consideration. The most common of these drugs are Ritalin and Adderall. If there is a documented use of Adderall in a non-prescribed basis — as in an emergency room visit — with such side effects as high blood pressure, stroke, or other aggressively disruptive behavior, you will likely be unable to obtain a waiver. Waivers are only reviewed on a doctor prescribed program for minor attention deficit issues. Any depression, bipolar disorder, or other mental health problems associated with some ADD/ADHD diagnosis tips the scale into an area of medically disqualifying issues that are not waiverable.